»Bhandardara – Getaway To Nature's Paradise! Bhandardara – Getaway To Nature's Paradise! Tucked away from the city hullabaloo, Bhandardara is an offbeat and quaint little hill station located at a distance of 165 km from Mumbai. Snuggled in the depths of nature, the hill station is blessed with waterfalls, lakes, dams and hilly regions. It is at an elevation of 2460 ft, located in the Ahmednagar district, and settled on the river Pravara. Bhandardara, is therefore, the ideal getaway destination for nature enthusiasts, or for people looking for a tranquil break from routine. According to a myth, Sage Agasthya performed severe penance at Bhandardara for a year. The gods blessed him with the Ganga River since they were utterly pleased by this act of devotion. The same river gifted to him is now known as the river Pravara. Bhandardara is not only is a paradise for nature lovers, but with peaks and forts, it is also a sought after destination by trekkers and rock climbers. The months of September to February are ideal to visit Bhandardara if you want to relax in a pleasantly cool weather. Monsoon months are equally or even more beautiful since the waterfalls and lakes will be rain-fed and brimming with water, but trekking during this season might be dangerous and commuting can get messy. Read further about the places to visit in and around Bhandardara. Once you leave Mumbai, the places that you will encounter are Thane and Kalyan. These metropolitan cities are dotted with places to visit. Thane has amusement parks like Vardhaman Fantasy Theme Park, Tikuji Ni Wadi, Sanjay Water Park etc, perfect to spend time with the kids. Kalyan has a Kala Talo Lake and Durgadi Temple which are the two main attractions of the city. Mahuli Fort is made of two or more hills that share a common pinnacle. The fort is paradise for trekkers since it is the highest point of Thane district. It was originally built by the Mughals, which now stands as ruins with lush green grass and moss beautifully covering the ruined fort. It is located in Asangaon, 48 km from Kalyan and is at an elevation of 2,815 ft. Trekking clubs regularly plan a trip to this beautiful, secluded fort. This secluded and offbeat tiny hill station is located at a distance of 58 km from Asangaon. This little haven is home to Bhatsa River Valley, Camel Valley and many peaks that give a fantastic panoramic view of the entire hill station. Trekkers and nature lovers usually prefer this place for a quiet and rejuvenating break from their routine. Read further about the places to visit in and out of Bhandardara. Also known as Lake Arthur Hill, the Arthur Lake is nestled between the forest thickets of the Sahyadri Mountain range at Bhandardara. It is a 34 km long lake, along which the Wilson Dam has been built. The construction of this dam began in 1910 and was completed by 1926 by the British, making it one of the oldest dams in India. 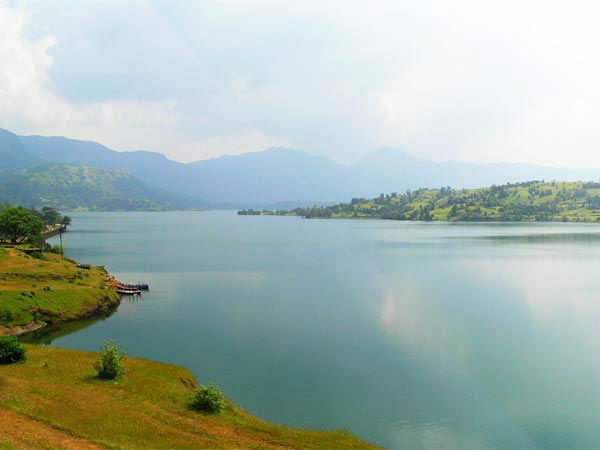 The tranquil and picturesque lake is Bhandardara's most sought after tourist destination. The lake has boating facilities as well, to get a clear view of the surrounding environment. During monsoon, the Wilson Dam overflows with water from the northern most region, which falls in the shape of an umbrella over the rocks. This is how the waterfalls gets the name. A bridge right below the waterfall gives a fantastic view of the majestic falls gushing with water in full speed. The Umbrella Falls however, can only be seen during the monsoon season. Favorite among trekkers, Mount Kalsubai is considered to be the highest peak of the Western Ghats, perched at an elevation of 5400 ft. This peak is surrounded by forts and houses a temple. These forts belong to the Maratha Empire, and the Kalsubai Peak was said to be the place from where the Maratha Dynasty kept a watch on the neighbouring enemy kingdoms. There are many trekking routes to climb the Mount Kalsubai. However, three iron ladders have been built by the authorities for a safe climb up the mountain. Situated about 13 km from Bhandardara, the Ratangad Fort is another popular place of tourist attraction. The fort is at an elevation of 4250 ft, and a favoured destination for trekkers. Formerly used by the Mughals, the fort was then conquered by Shivaji Maharaj. This 400-year-old fort has 4 gates, 2 caves and numerous wells spread around the fort. One of the two caves is big enough to accommodate almost 50 people! Ratangad Fort is therefore a haven for the adventurous ones! Amrutheshwar Temple is dedicated to Lord Shiva, and is located in the Ratanwadi village, which is 15 km from Bhandardara. This 1200-year-old temple, comes under the Archaeological Survey of India. Built using red and black stones in the style of Hemadpanthi architecture, it is a magnificent temple with exquisite murals, pillars and rock carvings.